Hijackers took control of a Colombian commercial airliner on a domestic flight and forced it to land on a highway before kidnapping several passengers, the country's civil aviation authority said Wednesday. The operations chief of the Colombian Air Force, Gen. Gonzalo Morales, said the hijackers were members of the nation's largest guerrilla group, the Revolutionary Armed Forces of Colombia, or FARC. But the civil aviation authority said it was still not confirmed who had diverted the plane. The Dash-8 Turboprop belonging to Colombia's Aires airlines had been on a flight from Neiva, the capital of Huila state, to the capital, Bogota, when it was hijacked Wednesday morning, said Martin Gonzalez, spokesman for the civil aviation authority. Morales said the plane may have had between 30 and 50 passengers aboard. 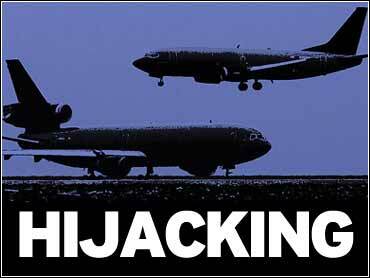 The hijackers disappeared with two or three passengers after the plane landed on the highway in southern Colombia. The passengers and crew who were left behind appeared to be safe and in good health, the official said. Morales said government helicopters and warplanes were sent to the area.